Discussion in 'Android Devices' started by MiamiFin33, Aug 11, 2010. No matter where I go I have terrible 3G coverage. Either a weak signal or no coverage at all. I've had a blackberry before and always had great 3G coverage in these same areas. What could be the problem? The bars on the phone isn't really a reliable indicator of coverage. 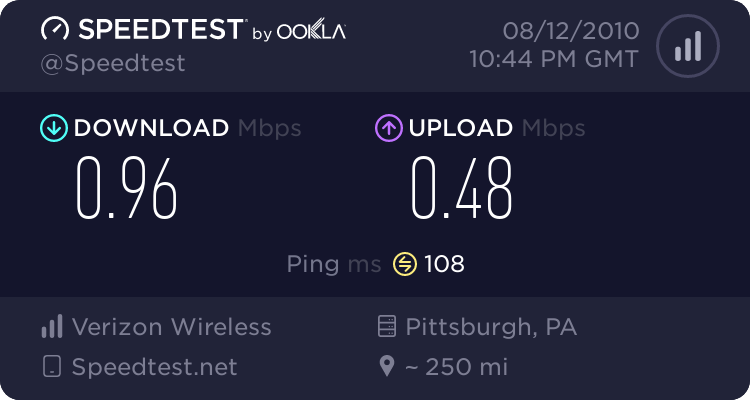 Have you tested your data speeds? The result isn't fantastic but it's not horrible either. Considering that it was tested at 6:45 pm in a densely populated area, and less then 1/3rd a mile away from where two heavily traveled Interstates meet.